If Paris in the Springtime conjures up images of endless crowds, consider visiting France in the off-season. Bargains abound, the lines for all attractions are short and you can live the life of a local. For the tourist industry, the year is divided into peak season (roughly mid-June to the end of August), the shoulder season (April to mid-June and September and October) and the off-season (November to the end of March). Hotel rates: This is the time to look for those luxury hotels that maybe are too expensive in the peak season. Again, there are lots of bargains from top hotels wanting to keep their occupancy rate high. You will find some bed and breakfasts closed, but the ones that are open will be offering good rates. Car Hire: This is another facility where you’ll get good rates, so you can upgrade if you want a more comfortable drive. Sightseeing: There is nothing more pleasant than having a château to yourself as you wander through the rooms, feeling like the royalty or aristocrat you really should have been. Paris is a beautiful city, but when the temperatures drop and the snow starts to fall, it is transformed into a magical place. The shops do a slap-up show with their decorations and there are plenty of buildings illuminated to add to the fairytale atmosphere. And everyone is cheerful. Christmas is a magical time to visit France. 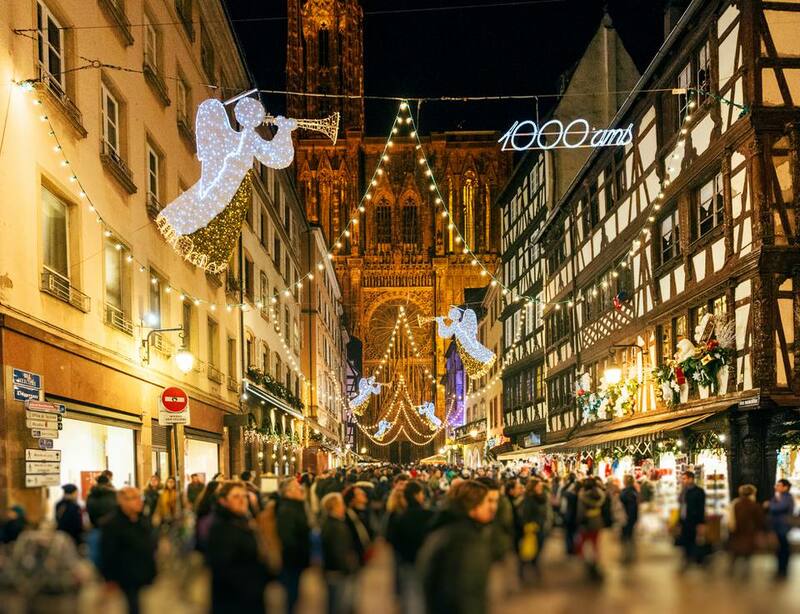 Not only do you have those great Christmas markets; you also get some extraordinary illuminations: light shows on the buildings and cathedrals that bring a fairy-tale quality to this time of year. Weather: France is a vast country with very variable weather from north to south. The weather can be bad, or could even result in flight delays. If you’re going ti stay in the north you will have to pack warm clothing; even on bright sunny days, the air is cold and the nights can freeze. If you’re going south, be prepared for all kinds of weather. On the Cote d’Azur days might be warm and sunny but even this far south, nights can get very chilly. In Provence the average temperature for December is 14-degrees Celsius, or 57-degrees Farenheit. Also remember that it is getting dark at 5 p.m. so if you’re driving and are a little uncertain, give yourself plenty of time to get back to your hotel while the light is good. But there’s nothing better than a day outdoors and a crisp evening when you can settle down in front of a crackling fire feeling you’ve earned that drink...and that’s a pleasure you don’t get in the summer months. Tourist Offices have much shorter hours; some close entirely; others are only open on certain days or in the morning. Often English-language tours of sights or in museums don’t operate outside the peak season. But all in all, I would thoroughly recommend a vacation in France in the off-season; you'll be surprised at the difference.